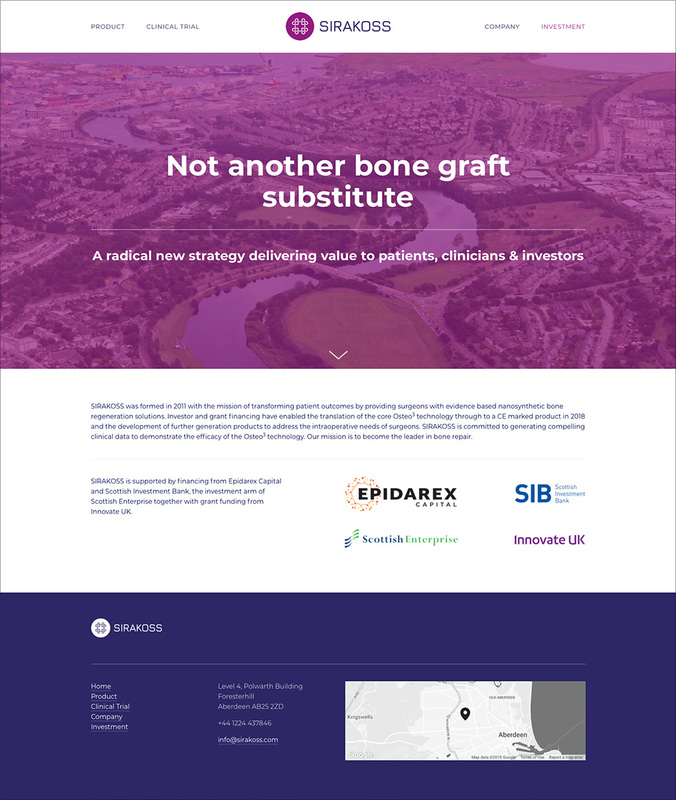 Sirakoss is a med-tech startup with a revolutionary bone grafting product designed to outperform everything else on the market, in terms of both efficacy and safety. I was initially asked to look at the structure and design of the company’s investor presentation, but this gradually developed into a much wider remit—including an update to the brand and the development of a new company website. Sirakoss’ founders were keen to simplify their message to appeal to a broad church of investors—many of whom wouldn’t have experience in med tech. This was achieved by developing a straightforward and relatable narrative, coupled with clear and impactful visuals. Sirakoss already had a logo which reflected their Scottish roots and enjoyed some recognition among medical and investment communities. However there were concerns it appeared a little too twee and wasn’t adequately communicating the high-tech, ambitious nature of the company. So I was asked to refresh the brand to better reflect the company and its products. Several other options were considered, and used to steer us towards the final design.